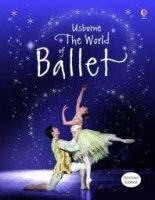 This is a fresh new edition of this comprehensive book perfect for anyone who has ever wanted to dance, or to look behind the scenes at the enchanting world of ballet. The topics covered include: the history of ballet and its most famous names; how ballets are staged; the basics of ballet, with step-by-step photographs of exercises featuring professional dancers; and a glossary of ballet terms, including a useful pronunciation guide. It also contains fully-updated internet links.